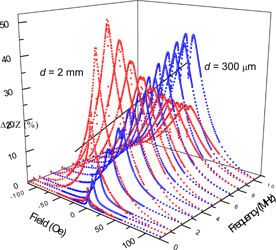 The influence of varying width from 4 mm down to 300 µm on the giant magnetoimpedance (GMI) effect in soft ferromagnetic amorphous Co65Fe4Ni2Si15B14 ribbons has been investigated. In the frequency range of 100 kHz – 10 MHz, we find that the reduction of width to the microscale degrades the GMI effect at low frequency range (f < 5 MHz), but enhances it in the high frequency range (f > 5 MHz). At 10 MHz the GMI ratio of the d = 300 µm microribbon (~45%) is about three times larger than that of the d = 4 mm ribbon (~15%). The magnetoresistance (MR) dominance, skin effect, and the characteristic frequency at which the GMI peak occurs are shown to shift to a higher frequency with a decrease in the sample width. A simplified skin depth model is shown to explain a correlation between the skin depth and high-frequency GMI in these reduced dimension ribbons. Our studies provide important insights into the correlation between the GMI effect and ribbon dimensions towards the GMI optimization and demonstrate the usefulness of soft ferromagnetic microribbons for high frequency sensor applications.